Beach and Bay — Seahorse, Gulf Coast TX. A place that honors both nature and community. Seahorse has designed amenities that provide for optimal enjoyment of our ideal location between the Texas Gulf and Drum Bay. Our elevated promenade over the wetland refuge to Drum Bay is a new walk each time. With a diversity of wetland wildlife, and fish jumping, the bay provides a great show any time of day. Take off from our private kayak launch at the end of the bay boardwalk and enjoy a rare paddling or fishing adventure throughout the Drum Bay Preserve. Test your skills and head out to the Gulf side to kayak among the dolphins and ride the waves. Along the bay boardwalk is a members only crabbing pier and fishing pier at the end of the boardwalk, and the beginning of Drum Bay. The family catch makes for great dinner conversation and new traditions around the table. 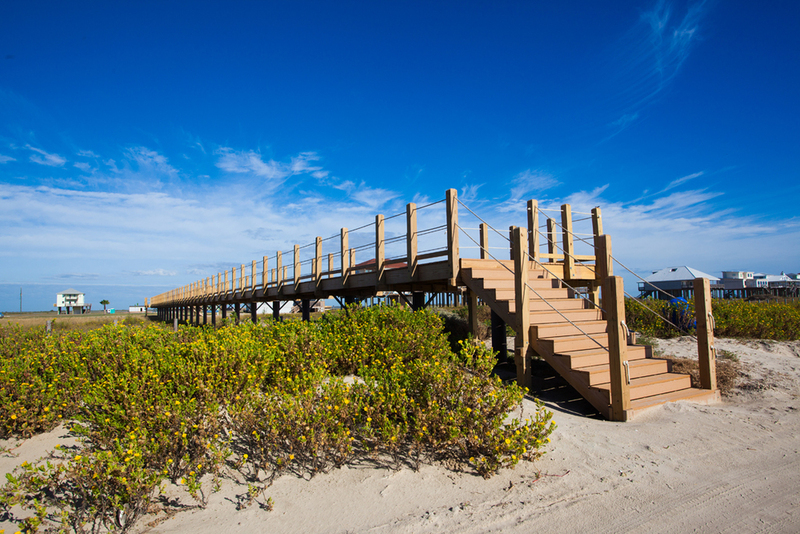 Enjoy a 200 foot walk over the dunes to the beach - where relaxing and play begin. Learn Bocce Ball on our natural soil and asphalt court, host a bocce ball showdown and potluck picnic for teens and families to gather. Teens who want and need space on their own will find a sport court for pick up games and an outdoor gym. Seahorse is included along the Great Texas Coastal Birding Trail. We are located within the Upper Texas Coast Trails Bluewater Loop. Members have private access to view along our bay boardwalk. Learn more about our trails.